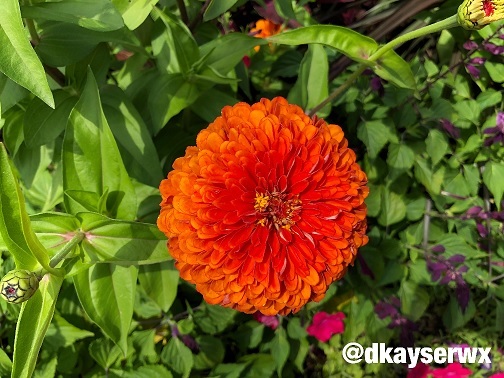 It's time to start another work week here on Monday, but looking backwards... wasn't that just a fantastic weekend of weather here across southern Minnesota? Highs in the low to mid-80s here in the Twin Cities, right around average for this time of year, with fairly fine dew point values in the low 60s. I do have some good news for those of you who don't like the steamy, sweltering parts of summer. The 6-10 day temperature outlook from the Climate Prediction Center shows below average temperatures to end the month across the upper Midwest. Here's a look at the month so far in the Twin Cities. We have had our share of warmth, with four days at or above 90 for a high, and all but two days have been at least in the 80s for highs. 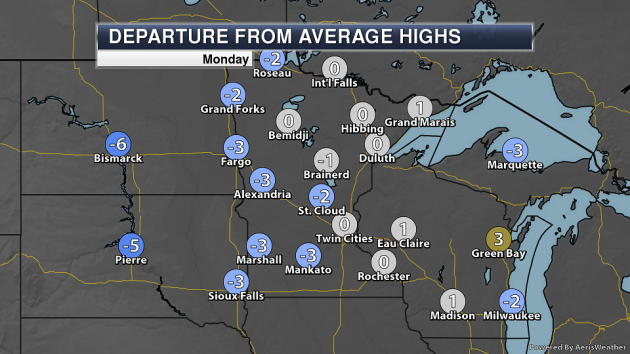 Only five days have had an average temperature that was below average. The average temperature so far in July has been 76.2F, which is 2.4F degrees above average. Either way, this cooler stretch of weather will be welcomed, if nothing else since we'll get to give our air conditioners a break! 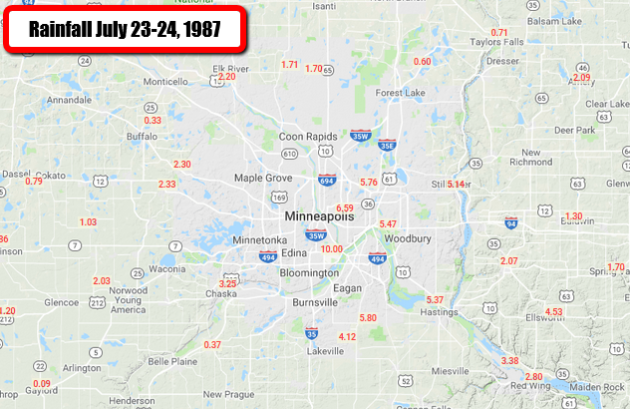 Thirty-one years ago Monday marks the 31st anniversary of the beginning of the 1987 Twin Cities Superstorm which brought the Twin Cities airport 10" of rain in an eight hour period, with 9.15" of that falling in five hours. This event is still in the record books as the greatest two-day rain event in Twin Cities history. The Minnesota Climatology Office has a write-up on this event here. "Science is the great antidote to the poison of enthusiasm and superstition" wrote Adam Smith in "The Wealth of Nations", back in 1776. The internet has generally been a force for good. I can now order a ham sandwich online. But in an age of alternative facts some choose their own version of reality - facts, evidence and data to the contrary. The Apollo moon landings were faked. The Earth is flat. A 2015 poll suggests as many as 12 million Americans believe in "Lizard People". We live in interesting times. I see no evidence of large-scale 'weather weapons' or chem-trails. I'm sure free to change my mind, but I prefer real evidence over conspiracy theories. A fizzling front may spark a stray T-shower today; a much better chance of showers and T-storms late Wednesday, as a September-like cool front sweeps into town. Sweatshirts may be required up north by Thursday. ECMWF guidance hints at an even cooler front early next week, as the atmosphere tries to compensate for a toasty start to summer. Odds are we'll enjoy (wrong word) more 90s, but that won't happen anytime soon. MONDAY: Slight risk of a T-shower. High 84. Low 64. Chance of precipitation 30%. Wind NW 8-13 mph. TUESDAY: Plenty of sun, probably dry. High 82. Low 65. Chance of precipitation 10%. Wind NW 10-20 mph. WEDNESDAY: Sticky, heavy T-storms PM hours. High 81. Low 58. Chance of precipitation 70%. Wind W 7-12 mph. THURSDAY: Cooler. Patchy clouds, passing shower. High 72. Low 56. Chance of precipitation 30%. Wind NW 15-25 mph. FRIDAY: Partly sunny, a little nicer. High 77. Low 59. Chance of precipitation 20%. Wind NW 10-15 mph. SATURDAY: Sunny spells, slight shower risk. High 79. Low 60. Chance of precipitation 30%. Wind W 5-10 mph. SUNDAY: Sunny start, PM pop-up shower chance. High 81. Low 61. Chance of precipitation 30%. Wind W 5-10 mph. 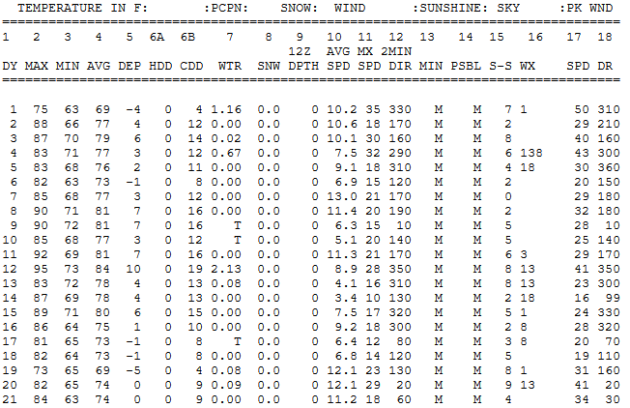 1987: The greatest deluge ever recorded begins in the Twin Cities, with 10 inches of rain in six hours at MSP airport. As a cold front moves through Minnesota, a few scattered showers and storms may be possible Monday, mainly across eastern and southern parts of the state. 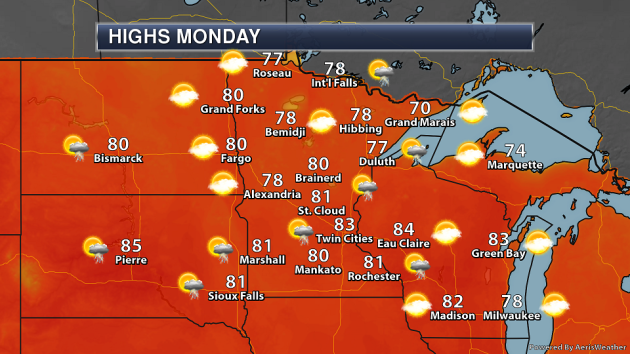 Highs will range from the 70s across northern Minnesota to the low 80s across the southern two-thirds. Those highs in the 70s and 80s will be right around to just a few degrees below average for July 23rd. 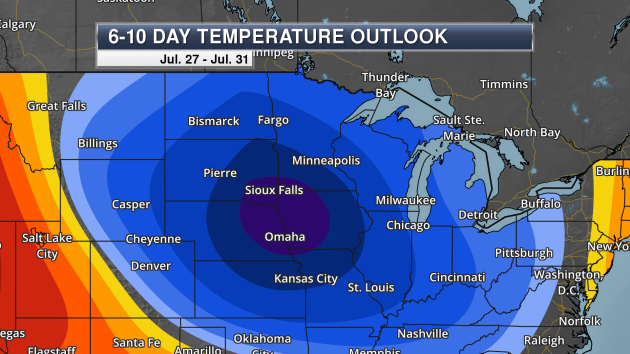 No 90s are in sight over the next couple weeks here across the Twin Cities. Highs will be fairly steady in the low 80s through the beginning of this week before another cold front moves through Wednesday, dropping temperatures back into the 70s for the second half of the week and into the first half of the weekend. Very few rain chances are in the forecast this week in the Twin Cities. The only chances through the end of the week will be with the two frontal systems Monday and Wednesday, and even those potential rainfall amounts don't look all that impressive. Maybe parts of the state will finally get to dry out a little after the deluge of rain that has fallen in recent weeks. On Monday, another round of showers and storms are expected from the Carolinas to the Northeast, bringing the chance of heavy rain and potentially flash flooding. A frontal boundary across the Southeast along with plenty of moisture from the Gulf of Mexico will allow showers and storms capable of heavy rain to form. Some severe weather will be possible along the northern Gulf Coast and the Florida Atlantic coast with these storms. A frontal system moving through the upper Midwest will bring a slight chance of rain. The heaviest rain through Friday morning will be across parts of the eastern United States, where rounds of rain could allow totals of 2-4"+ to tally up through the week. Some heavy rain - especially early this week - along the Rockies in Colorado and New Mexico could allow totals of 1-2"+ to add up in those areas. 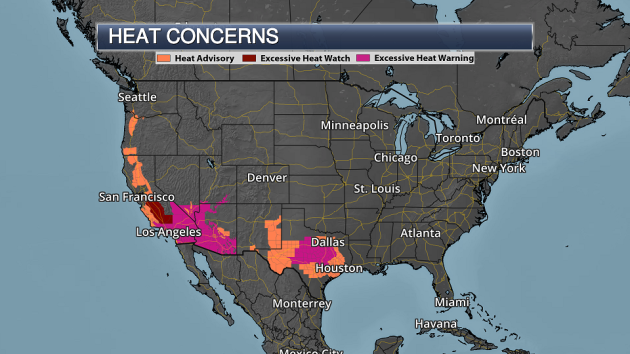 Numerous Excessive Heat Warnings and Heat Advisories are in effect from the Southwest into the Southern Plains. Many of these across the Southern Plains will continue into the day Monday due to ongoing heat. Meanwhile, across the western United States, the watches, warnings and advisories are in effect for the early and mid-week time frames. Heat has already been impacting parts of the Southern Plains this weekend, and it will continue into Monday as well. The good news is that for Dallas, temperatures will end up being slightly cooler than they have been the past few days. 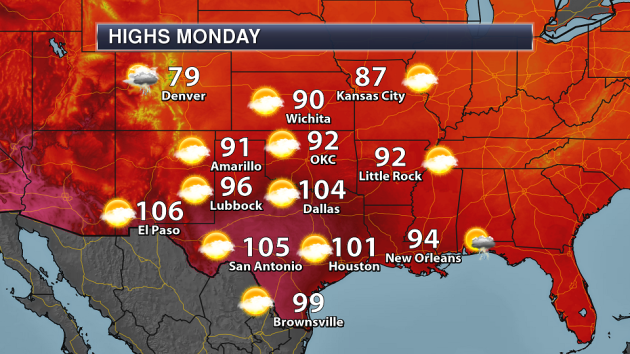 Areas like Austin, Waco, Corpus Christi, Houston, and El Paso could see records on Monday. 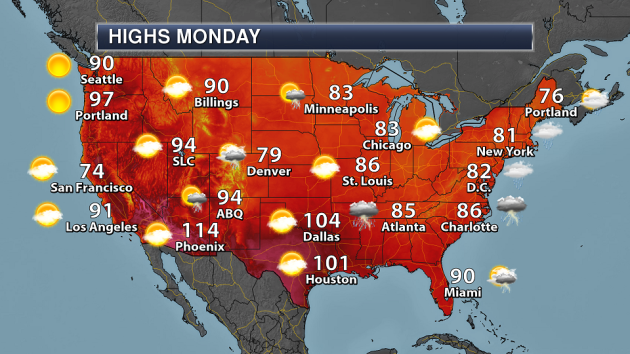 The heat kicks into gear across the Southwest Monday, with highs at or above 110F expected in Las Vegas and Phoenix. Both Phoenix and Tucson, as well as Needles (CA), could see records broken. 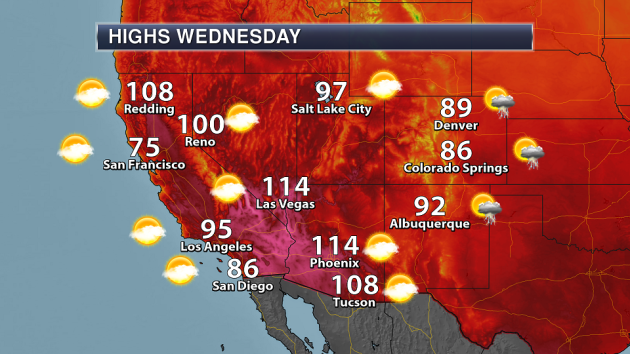 The heat continues to build Tuesday, with Tuscon joining the 110F+ club. 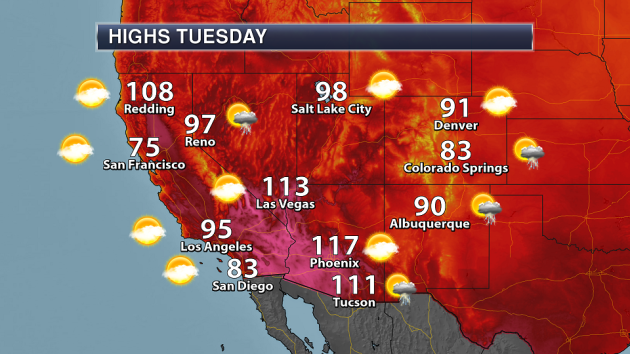 Places like Phoenix, Tucson, Yuma, Needles, and Burbank could all see record highs on Tuesday. If the high does reach 117 in Phoenix, it would only be the 26th time in recorded history that Phoenix has observed a high of 117 or higher. Another day of excessive heat is expected Wednesday, with highs reaching 114 in both Las Vegas and Phoenix. Record highs will be possible for areas like Phoenix, Tucson and Los Angeles (LAX), which will see a high of 85. Warmth will stretch north into the Pacific Northwest as well this week. 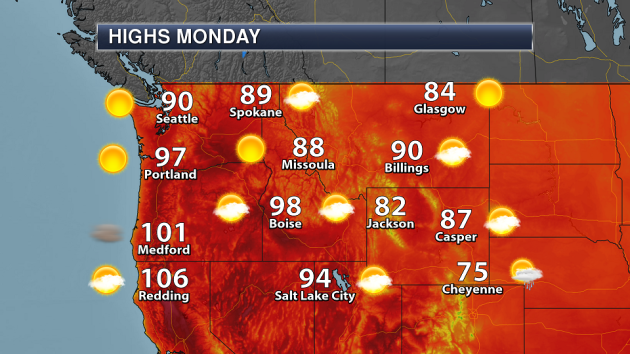 Here's just a look at highs expected Monday, with both Seattle and Portland expected highs in the 90s. 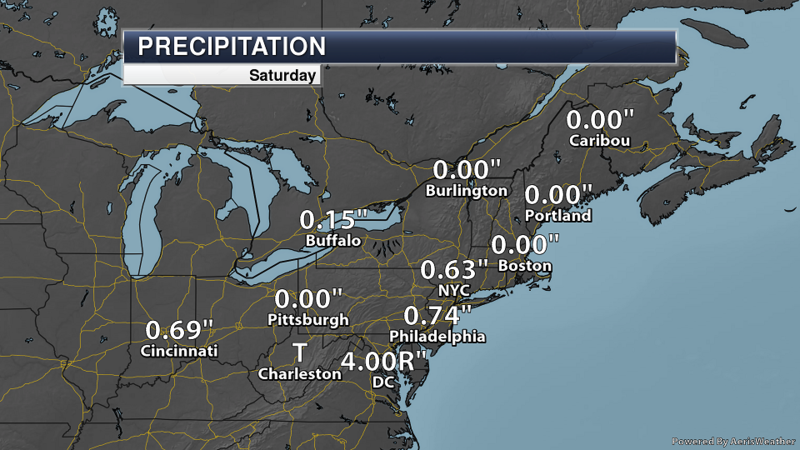 Washington, D.C. (Reagan National Airport): 4.00"
Washington, D.C. (Dulles Airport): 5.02"
Some rain totals topped 6" around D.C., which once again led to numerous reports of flooding and even water rescues. 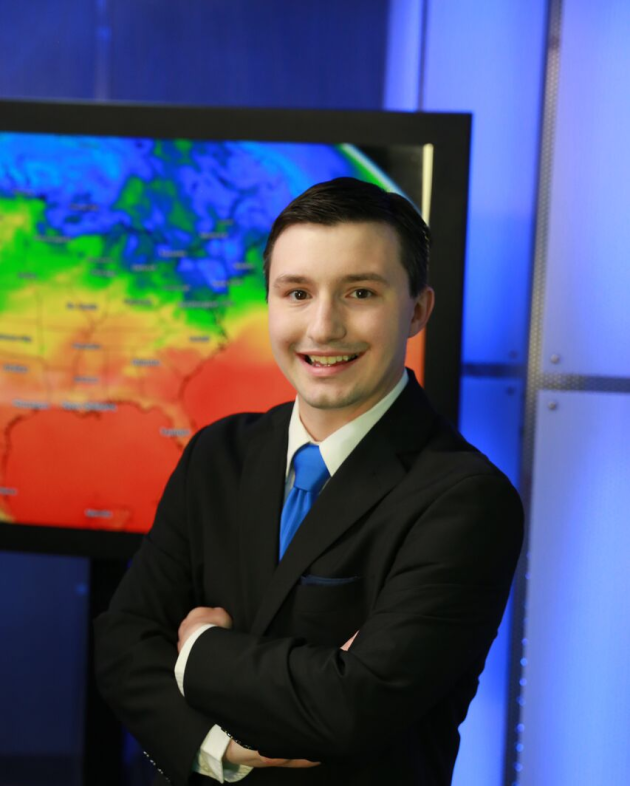 The Capital Weather Gang kept a blog going Saturday with the latest on the rain. More from WMFE: "More toxic algae is feared in coastal estuaries as water managers announce plans to resume flows from a water-swollen Lake Okeechobee. The flows come after record rain in May pushed the state’s largest lake close to its highest level in more than a decade, with four months remaining of hurricane season. Water managers plan to minimize the impact by discharging lake water in pulses, simulating rain. Advocate Jacqui Thurlow-Lippisch says she worries about the Indian River Lagoon. “I hate to say this, but I don’t see this algae problem going away. I don’t see how it can, with the temperatures rising, and more people moving and the pollution. We’re going to be stuck with this for about 10 years.”"
More from Al Jazeera: "Dozens of wildfires are raging across Sweden, which is going through its worst drought in 74 years. The wildfires broke out after months of high temperatures. The Swedish prime minister says all resources are being mobilised to prevent a greater disaster and Sweden has asked for help from other nations." More from Bloomberg: "Poring over four decades of satellite data, climate scientists have concluded for the first time that humans are pushing seasonal temperatures out of balance—shifting what one researcher called the very “march of the seasons themselves.” Ever-mindful of calculable uncertainty and climate deniers, the authors give “odds of roughly 5 in 1 million” of these changes occurring naturally, without human influence. "